To encourage secondary schools students in Hong Kong to express their thoughts on social affairs and related subjects that are affecting their daily lives. To increase their confidence in learning Liberal Studies and also improve their English writing skills at the same time. To assist school teachers with preparing Liberal Studies writing exercises for students. To share well-written essays with the public through the Junior Standard . Six awards will be given to the best essay of each Liberal Studies category. They will be shortlisted to win the overall Champion, First Runner-Up and Second Runner-Up awards. A further five merit awards will also be presented. The school with the highest number of entries submitted with the 'School Submission Form*' will also be awarded. For the Green Building Awards, the three best articles about the sustainable-built environment in Hong Kong will be awarded. Students tackle one of the six Liberal Studies topics by writing a short essay. The students must decide which category their writing fits in and submit it within the time period as shown below. They can also submit more than one entry throughout the Competition. 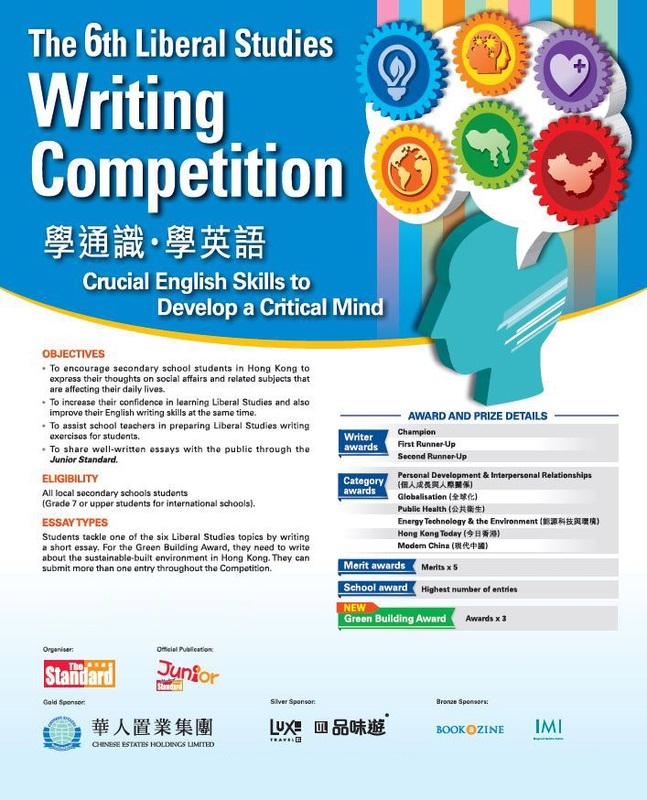 To win a Green Building Award, in addition to submitting an essay under the six Liberal Studies categories, students also need to write a short essay on their views about the sustainable-built environment in Hong Kong. They can submit one or more essays to win this award. Format Entries must be submitted either online or in paper format (A4) by post. All other formats such as through email or fax will not be accepted. * In order to win the school award, all entries must be submitted by a representative of the school in paper format by post. A valid 'School Submission Form' must be completed with the school chop stamped. For more information please email us at marketing@thestandard.com.hk .